Amazing coincidence, we are moored for these few hours near Damien's sail boat, on his way to Spitsbergen. He was working at Ny Alesund for IPEV and took care of our dogs Jin, Frost and Imiaq when Vagabond left Svalbard (summer 2009). At least I meet him, he is wearing a Tee-Shirt Vagabond and has nice pictures of our dogs in his boat! Then, it is a quite difficult progress to the West, doing our best with each low passing over (we don't count them anymore!). 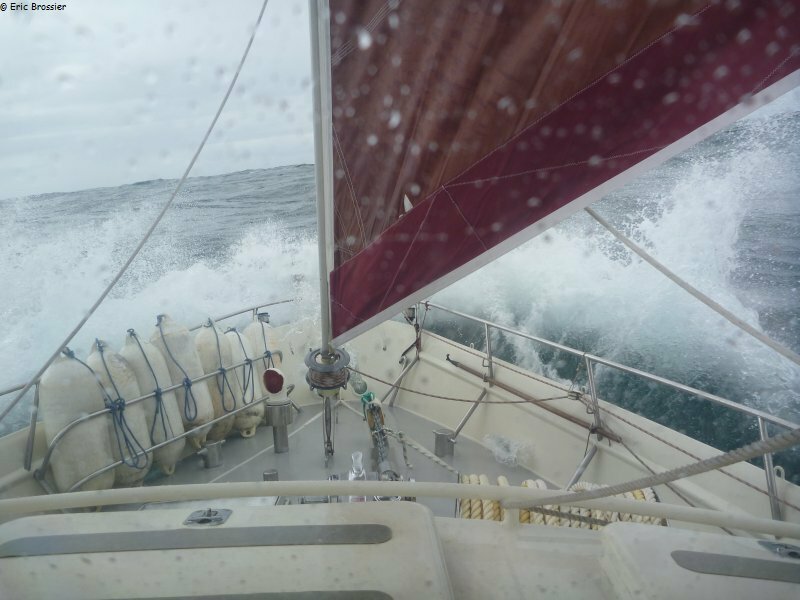 Not much good winds for this rough trip, in conditions getting a bit more complicate with sea water in diesel or leaking windows, for instance... Our main goal is to reach Greenland with minimum damaged on Vagabond and on her heavy equipment and supplies. Fortunately, there is a good spirit on board, six of us are well sea adapted now, and know more and more about the boat. Few pilot whales and many birds, watched mainly when weather is better. For Christian, our faithful and important weather advisor, "the crew will remember this cruise for a long time". Despite the strong westerly winds forecast from tomorrow, drifting ice are still surrounding pretty much Cape Farewell (Southern tip of Greenland). France, Léonie and Aurore, if the Island's volcano agree (no yet black sand on Vagabond's deck! ), should arrive tonight in Narsaq, South of Greenland, where they will wait for us, for a few days or more.